​They approached the front of the room one by one. Once positioned, they introduced themselves and identified their topics. Ans then it was time to start talking. Each one had a different cadence, a different decibel level and a different presentation style. 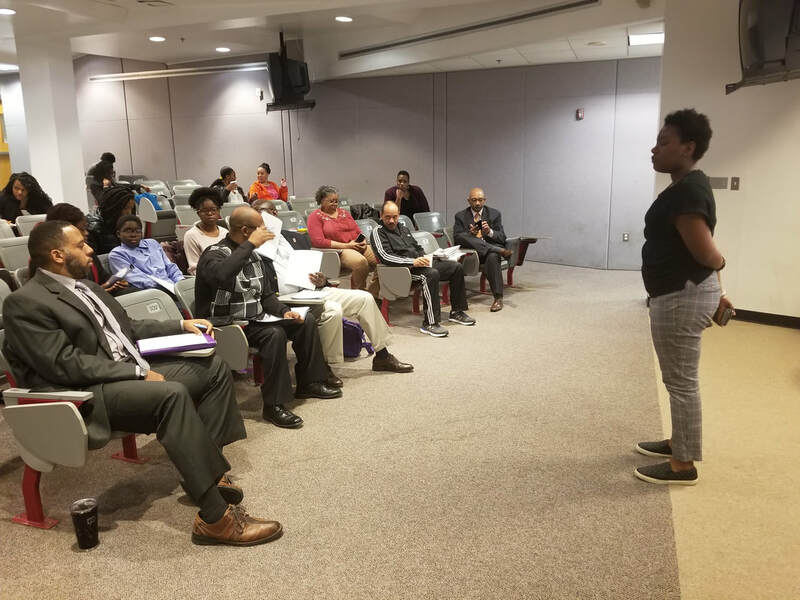 But one thing that is common to each of the students who presented their essays at Saturday’s Project ENRICH session, is that they all had the opportunity to research and talk about an important part of Black history. Each year, the April essays are nail-biting time for the students who must overcome the jitters to stand tall and deliver a coherent talk in a room full of their peers and parents. But it’s also one of Project ENRICH’s top learning activities. It goes to the core of one of the program’s key goals, to help students learn vital verbal communication skills as they prepare for college and life afterwards. The students are assigned topics according to their class standing. For example, the freshmen were asked to research and write essays about the early 20th century Camp Logan Riots. What precipitated the riots and were the actions justified? The sophomores were given the task of orating on A. Phillip Randolph and the Brotherhood of Sleeping Car Porters. The juniors spoke about The Great Migration of the 20th century that saw millions of African Americans “head north” to escape the clutches of Jim Crow in the deep south and latch on to better job opportunities. Finally, the seniors discussed the two types of African American leaders who dominated at the turn of the 20th century – the Assimilators and the Liberators. Which one should Black people have followed? ​Project ENRICH Director Bro. Willie Hines views the essays as a training exercise for public speaking, as well as a venue to develop critical thinking skills. The students seem to understand and appreciate. After each presentation, students are given a critique by a panel of Project ENRICH staff, which included Gamma Pi members Hines, Lawrence Branch, Pete Ford, Marc Ellington, Jason Crump and James Riley. Project ENRICH awards prizes in every grade group. Winners will be announced next month.